How to Clean Gmail Inbox? With over 1.2 billion users and 20 percent of the global email client market share, Gmail is easily one of the most popular email services out there. The service started as a limited beta release on April 1, 2004, offering 1 gigabyte of storage space and Gmail users can enjoy up to 15 gigabytes of storage space for free. This article will explain how to clean up Gmail inbox, how to delete old emails in Gmail, and how Clean Email inbox cleaner can help. With so much free space, it’s no wonder that Gmail users sometimes neglect inbox management, never deleting old emails and seldom unsubscribing from newsletters they are no longer interested in. Because those 15 gigabytes of storage space that all Gmail users get to enjoy for free are shared across all Google services, including Google Drive and Google Photos, a Gmail inbox can reach its capacity quicker than it might seem at first. When that happens, the natural reaction of most Gmail users is to delete as many old and useless emails as possible. However, Gmail users typically discover that deleting old emails in bulk is easier said than done. The problem is that not all old emails are equally useless. Hidden among advertisement, social media notification emails, and various one-time confirmation emails are old bank account statements, login credentials to various accounts, and personal and work-related messages. To avoid deleting anything valuable, Gmail users have to manually select each email they wish to delete and go through thousands of emails page-by-page, which can take hours and days. First of all, you need to find out how much space you use on Google Drive, Gmail, and Google Photos. Sign in to your Gmail account and go to Google's Drive storage page. 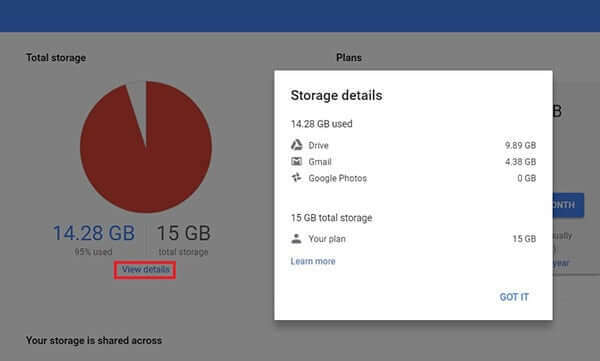 Click “View details” under a pie chart to see the storage breakdown by platform. 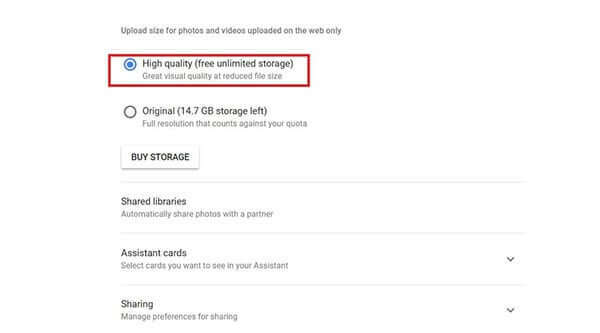 If the majority of your Google Drive space is being occupied by Google Photos, go to Settings and make sure the upload size is selected as "High quality" instead of "Original." Quality photos will be smaller than the original resolution and Google will give you unlimited storage. If a photo is larger than 16MP, it will be resized to 16MP. Videos higher than 1080p will be resized to high-definition 1080p. A video with 1080p or less will look close to the original. If you want to clean up your Google Drive, go to https://drive.google.com/#quota in your browser. You will get the list of your files, starting with the largest ones at the top. However, not everything in Google Drive counts toward your storage limit. Google Docs, Sheets, Slides, Forms, Sites, and files in "Shared with me" don’t take up space. After you have deleted the files you don’t need, make sure to empty the Trash folder. Otherwise, the file will stay there taking up your space. 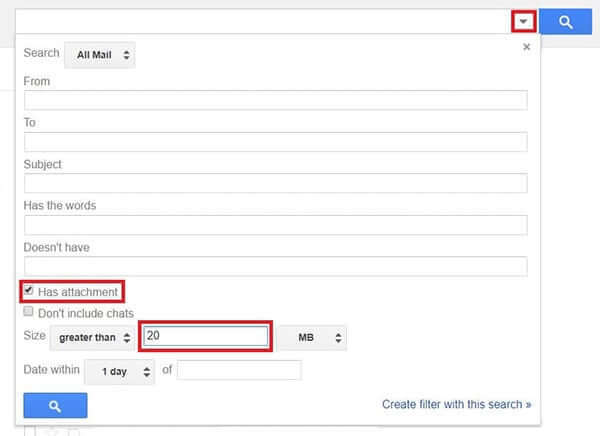 Are you wondering which emails are eating up space in your Gmail mailbox? It is very easy to find this out. Click the downward facing triangle on the right side of the search bar to show search options. You can search for emails with attachments and emails over a certain size, e.g. over 20 MB. 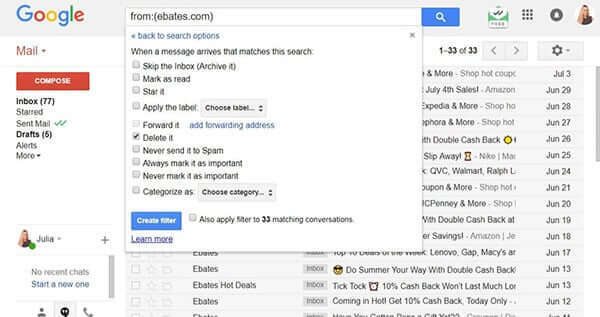 Gmail automatically sorts your emails into different inbox tabs, like Social or Promotions. You can find them clicking the gear button in the top right corner, then Settings > Inbox. You can easily delete all emails under the “Promotions” category which contains marketing emails and newsletters you are subscribed to. However, before deleting everything under the “Promotions” or “Social” category, we recommend first to make sure no important emails are being filed in that category. If the category doesn’t contain anything important, feel free to click “All” in the select menu in the top left corner. A yellow pop-up message will appear above the category tabs stating that only the conversations on this page are selected. If you receive a lot of promotional stuff, it would be not an easy task to clean Gmail and achieve Inbox Zero unless you unsubscribe from unwanted emails. The unsubscribe email mechanism for Gmail cleanup is usually very simple. Just open the email, scroll down, and click the unsubscribe link. This link is usually very small to prevent accidental clicks. If it takes too much time to find it, press CTRL+F and search for the term “unsubscribe” in the body of the email. However, professional spammers will keep sending you unsolicited emails even after clicking the unsubscribe link. Moreover, clicking on a fake link is equal to notifying the spammer that your email address is actively in use. Therefore, you should be very careful not to click unsubscribe email links from emails that might be from non-legitimate senders and look like real spam. Instead, you can easily create rules to block an entire domain name spammers are using. Click on the downward facing triangle on the right side of the search bar. Type the domain name under From. Click on the “Create filter with this search” option located on the bottom-right corner. Check the “Delete it” option to automatically delete all emails from the desired domain name. Click Create filter. Considering how time-consuming it is to manually clean up Gmail inbox, there must be a better alternative for how to clean up Gmail, right? A powerful email cleaner app is the best way how to keep mailboxes organized. Many of us receive tons of new emails on a regular basis, and it's stressful to know that we might be missing the truly important stuff among the less significant information. The best Gmail cleaner apps will help you simplify email management, and thus your digital life. Some apps let you turn your inbox into a to-do list, others feature smart filtering and automatic cleaning. We are recommending Clean Email as the most intuitive and powerful app to clean Gmail inboxes and other email services. Clean Email takes away the pain associated with manual inbox cleaning by helping you group and organize, remove, label, and archive emails in your Gmail account. With just a few clicks, you can group emails by size, age, or sender. Using smart rules and filters, it’s possible to separate unread emails from starred emails, subscriptions and social network notifications from finance emails, emails you replied to from emails you’ve sent to yourself, and much more. To clean out Gmail using Clean Email, you don’t even have to pay any money. Clean Email can be used for free to clean up to thousand emails, and unlimited cleaning starts at just $7.99 per month, which is remarkable considering how much time this Gmail cleaner can save you. With any email cleaner app, there’s always the question of trust and security. In order for any email cleaner for Gmail clean up old messages, you must give it your permission to access your inbox. However, not all cleaners require the same level of trust. Some, such as Clean Email, only analyze email headers that contain subject line, sender and recipient information, dates, email size, and similar metadata, while others access email contents or attachments contents, as well. Clean Email removes all logged user data from its servers after 24 hours as an additional security measure. The connection between Clean Email and your Gmail account is secured using 128-bit encryption and an authentication protocol called OAuth2. It takes just a few minutes to perform a Gmail cleanup using Clean Email. First, sign up for Clean Email. Next, connect Clean Email to your Gmail account. 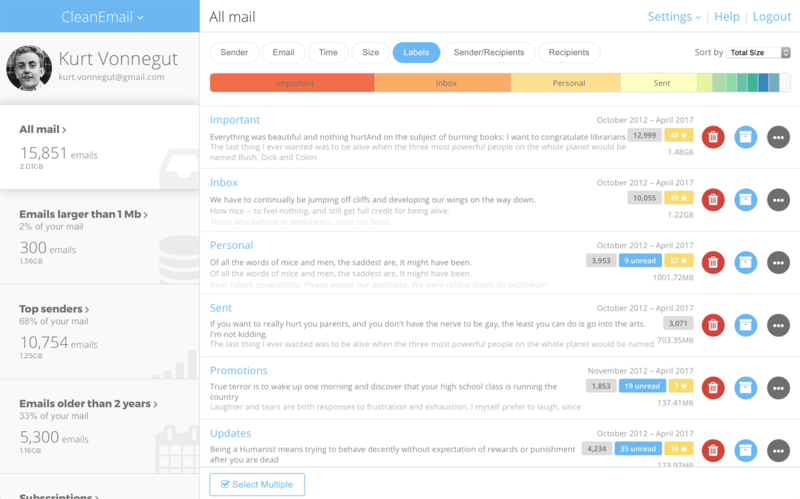 Clean Email will then analyze your inbox and give you several options how to clean it up. When it comes to inbox cleaning, email segments and advanced filters are your two best friends. 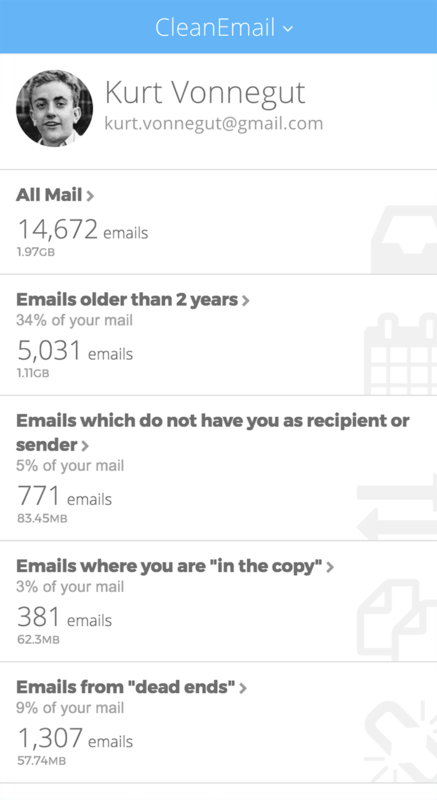 Email segments allow you to stop thinking about your inbox in terms of individual emails, and start thinking about it in terms of email categories. Some of the many examples of possible email categories with Clean Email include old emails, unread emails, starred emails, emails from dead ends, junk emails and spam, bounced email notifications, large emails, subscriptions, travel emails, drafts, emails to yourself, emails where you are in the copy, and many others. Clean Email allows you to label an entire segment, move it, delete it, or archive it. Once you start organizing emails by hundreds and thousands, you’ll understand what makes Clean Email such an effective tool for Gmail cleanup, and how much time it can save you compared to doing the same thing manually. Before you know it, your Gmail inbox will be sorted out, and you’ll finally be able to find important old messages without going through hundreds of junk emails. With Clean Email, even something as tedious as inbox cleaning can be fun and take no time. Besides Gmail, Clean Email also supports all popular email services, such as Microsoft Outlook, Yahoo Mail, Yandex.Mail, and others via IMAP. If you actively use more than one email account, you can purchase the $19.99 per month subscription, which lets you clean up to ten email accounts with no limitations. You can even share the subscription with friends and family members. Best of all, Clean Email never charges its users any hidden fees. Thanks to Clean Email’s commitment to security and privacy, users don’t need to worry about the company analyzing and selling their private data for profit to third-party companies.